With Roo celebrating her 10th birthday recently, I was all too aware that my baby girl was growing up fast. Her tenth birthday has brought her attitude and opinions, as well as a sense of no longer being a little girl. Up until now, I have had full control over her wardrobe. I do ask her opinion on items when we are shopping, however, if I don’t like something then I won’t buy it. Now that she is fully into her tween years I need to loosen the reins and allow her more input into her wardrobe. Boohoo Kids recently contacted me regarding their range of children’s clothing available from age 4 through to age 12. So I decided what better way to loosen my grips on the reins than by letting her select what items she would like from the site. Armed with a £35 spending limit I left her with my laptop to browse through the clothing items available. This took her quite some time as there were over 200 items available in her size. After looking through all the different items she called me through and showed me what she had placed in the basket. I must confess to thinking that it would be full of sparkly dresses that she’d hardly get any use out of. However, I was pleasantly surprised to find that she’d filled the basket with a host of everyday clothes that would boost up her wardrobe. For just £35 she’d managed to order two sweatshirts, three t-shirts, two skater skirts and a pack of tights. With the delivery taking just a couple of days I was pleased to see that the clothing quality was good. Plus that the sizing was accurate to other clothing stores. 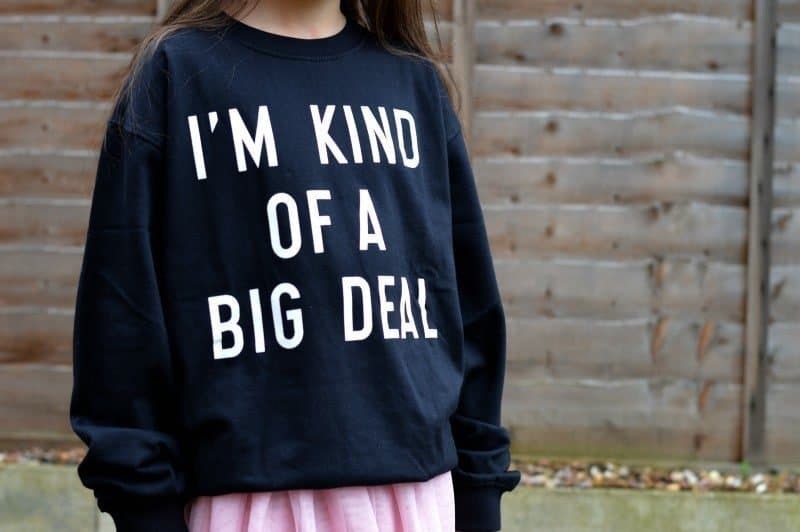 I adore the sweatshirts that she had chosen, with the ‘I’m Kind Of A Big Deal‘ one suiting her personality to a tee! Maybe it is time for me to let her have more control, and for us to take a look at Boohoo Kids more often. I wish I had seen their selection of seasonal clothing for Halloween and Christmas.